Fleetwood full-back Conor McLaughlin fends of Posh full-back Kgosi Ntlhe. Photo: Joe Dent/theposh.com. Peterborough United manager Graham Westley described his side’s performance at Fleetwood tonight (April 5) as an ‘insult to the travelling supporters’. 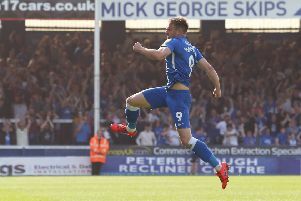 Posh went down 2-0 to a side battling to avoid relegation from League One. Skipper Michael Bostwick missed a penalty just before the interval when Posh were 1-0 behind. Marcus Maddison of Posh in action at Fleetwood. Photo: Joe Dent/theposh.com. But Westley was no mood for hard luck stories. He ranted about a lack of intensity, will-to-win and heart from his players. “I would describe that display as an insult to our fans,” Westley raged. “We didn’t come close to matching the heart, the desire, the passion or the endeavour of the opposition and that’s unacceptable. “I was called over by a fan at the end of the game so I went over and he told me he would ‘die for the badge’. None of my players showed anywhere near that level of desire tonight. “We showed more passion after the game in the dressing room whgen a mess was made of a notice board. We needed that sort of passion on the pitch. “It was an appalling effort. It was nowhere near the standards we demand at Peterborough United and I won’t allow a repeat. “People ask for apologies, but the only acceptable apology is to win the next game. “We have players at this club who lack any sort of consistency. They can look good one week, but then they play with too much inconsistency the following week. “I will be picking players for the remaining games who want to prove they can be a part of a winning team next season. Posh remain 14th in League One. They host Rochdale at the ABAX Stadium on Saturday (April 9).